When Isabelle Schmit walked into the Department of Computer Science five years ago for freshman orientation, she looked around the room and counted only five women among 60 students. The number of female students who enroll in the department and graduate with degrees has increased dramatically in the last five years. “The increased visibility of students in the department has made a huge difference,” says Schmit ’16, who is pursuing a master’s degree at the University’s Goergen Institute for Data Science. In 2010 the department’s graduating class of 20 students included only one woman. This year, the expected graduating class of 119 students will be 34 percent female—double the national average. This, despite a recent University of Washington study showing that computer science nationwide continues to be a male-dominated culture where many women feel they do not belong. Two factors have helped change that at Rochester. The need for computing skills now permeates virtually every academic field, including the humanities and social sciences. The University’s unique open curriculum includes a cluster system that enables students to sample computer science courses, many for the first time, and then decide to continue with a minor or double major. 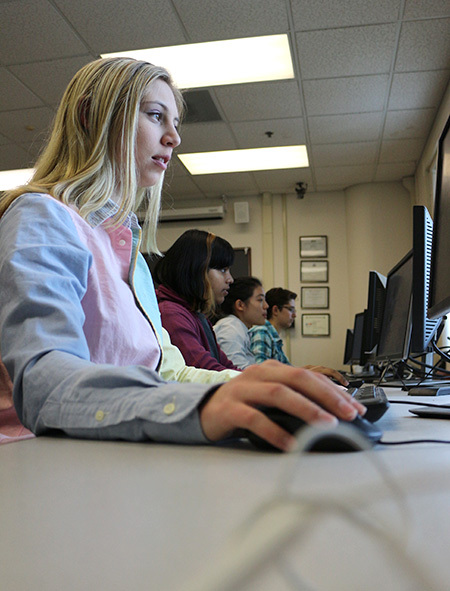 “We may start with 25 percent female enrollment in our freshman class but gain more women who add or switch into computer science during their sophomore and junior years,” says Marty Guenther, the department’s undergraduate coordinator. Seventy-six percent of the women graduating in the department’s class of 2016 were double majors, most of them also majoring in financial economics, digital media studies, linguistics, studio art, or mathematics. 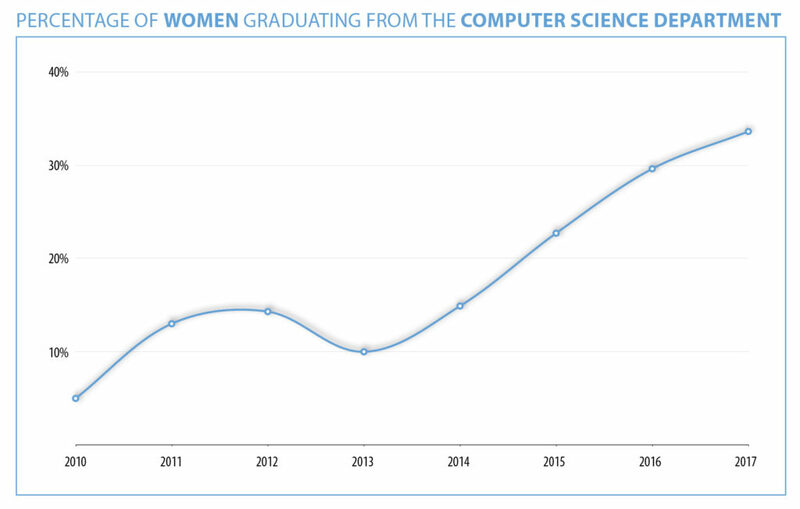 Percentage of women in the graduating class from the University of Rochester’s Department of Computer Science, 2010-2017. In 2014, the department became one of only 15 across the nation to join the BRAID (Building Recruiting And Inclusion for Diversity) initiative funded by Facebook, Google, Intel, and Microsoft and administered by the Anita Borg Institute. “Having taught many courses over the years with one or two or, sometimes, no women in the class,” says Sandhya Dwarkadas, the department’s current chair and only female faculty member, “I responded immediately to Maria Klawe’s call to action during the Computing Research Association chairs’ meeting at Snowbird in my first year as department chair to take proactive measures to help increase diversity in computer science. The positive response by 15 institutions led to Maria creating the BRAID initiative.” Klawe is president of Harvey Mudd College. Participation by the department included stepping up its recruitment of females and underrepresented minorities, creating more accessible courses for its clusters and majors, doing outreach to K–12 students, and building community among its female and underrepresented minority students. BRAID also pays for female students to attend the annual three-day Grace Hopper Celebration of Women in Computing, the world’s largest conference of women technologists. Students attend seminars on networking and workplace skills; hear female role models talk about their work; talk to alumni who took the same classes from the same professors and are now succeeding; and connect with companies. Many of the students return with internship or job offers or a promising schedule of interviews. “The BRAID initiative has really been a game changer,” says Michael Scott, a professor of computer science who could afford to send only a handful of students to Grace Hopper during his 1996–99 tenure as department chair. Last fall, 26 students from computer science and data science attended the Hopper conference. Schmit’s experience shows how important that can be. When she first attended Hopper as a senior in 2015, she was no longer convinced that web development—around which she had built her undergraduate program—was a career she wanted to pursue. At the Hopper conference that year she heard successful women in top positions talk about using data science in their work. It was a turning point for Schmit. She had enjoyed artificial intelligence in class, but did not realize how integral the field was in data science. “Because it was a relatively new field, I never thought I could find a job in it.” After Hopper she knew otherwise and changed her career path accordingly. When she attended Grace Hopper last fall, “it was so much nicer to be able to talk to companies and show them what I am passionate about,” Schmit says, “to see them being receptive to that and actually wanting me to work for them.” Schmit also took a lead role in organizing the other students who attended, which included holding preconference sessions on résumé writing and interview skills. The Grace Hopper conferences help build a sense of community among the female students who attend, which in turn has been a catalyst for Women in Computing (WIC), a subcommittee of the Computer Science Undergraduate Council (CSUG). WIC has about 100 members. Its meetings and events further the sense of community among female students. For example, at “coding parties,” students work on problems together and share ideas. “It’s nice to have a place where lots of girls are doing the same thing,” says WIC president Euakarn (Som) Liengtiraphan ’17. The group also has worked with CSUG and Dwarkadas to sponsor department “town hall” meetings to address concerns among female students about professor approachability, TA sensitivity, and having study spaces where women feel comfortable. The University of Washington study identified “lack of pre-college experience” as a contributing factor to female underrepresentation in computer science. The department has increased its outreach to female high school students through University summer programs. 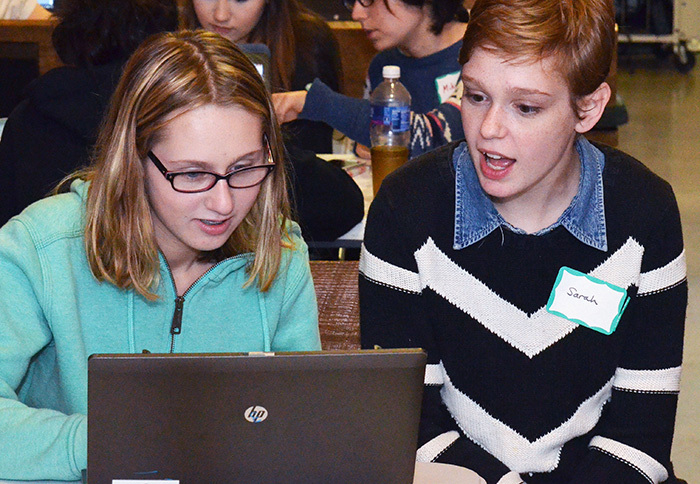 Its female students are also helping address the problem by working with Rochester-area schools and local Girl Scouts to introduce computing to young women. The events often include testimonials about the empowerment that comes with learning to code. When WIC visited the Harley School in Rochester this fall, Sarah Kingsley ’17 told the students that she had been more interested in art than science when she attended Harley. Then she took her first coding class at the University of Rochester and “fell in love,” prompting her to major in computer science as well as studio arts. Now the increasing presence of women is manifested in many ways. For example, nearly half of the student workshop leaders for introductory classes are women, providing role models for the women in those classes. Similar percentages of women participate on Rochester computing teams that compete against other colleges. That raises eyebrows among students from other schools. And it sends a message. “I think we’re getting a reputation as a woman-friendly campus,” Guenther says.